Pink stains appear on sofa or upholstery after cleaning. This article describes how the pink staining can be removed. 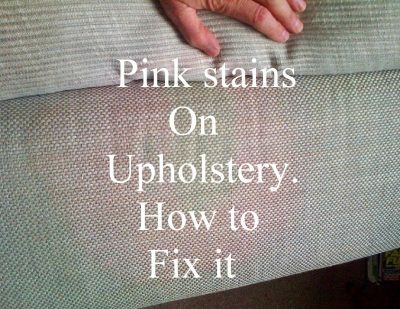 A problem that sometimes occurs is when your sofa or upholstey has been cleaned or becomes wet, is that pink stains can appear. This can happen on many different types of upholstery. There are several stories on appearing on forums about this fabric problem and it can be quite baffling how this pink staining can have happened. At first you may think that your sofa or upholstery is ruined due to the pink staining, but this is often not the case and can be corrected or put right again. If your ”sofa has turned pink” due to cleaning please read the article below to find the answer to correct the problem. What has caused the pink stains to appear on my sofa, chairs or upholstery? 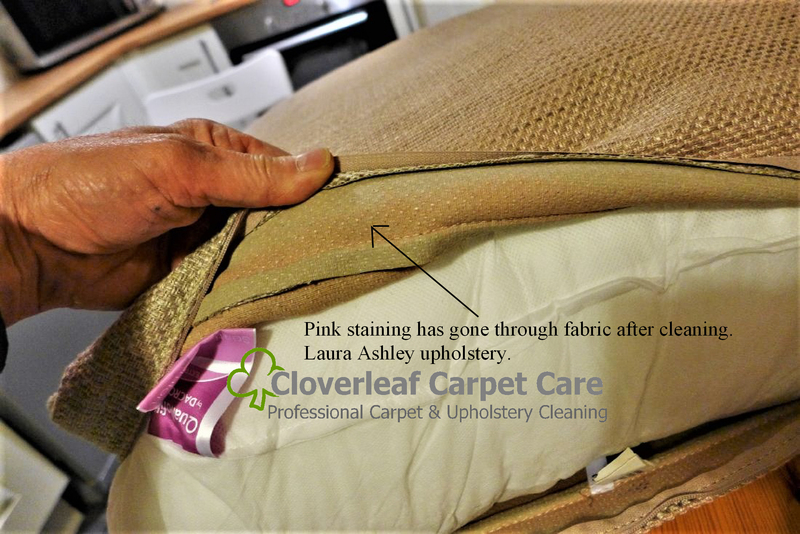 The answer to ”what has caused pink stains to appear on my sofa or upholstery” is that cleaning or a spillage has caused an indicator dye within the fabric to change its colour, therefore causing the fabric to turn pink. The liquid that has absorbed into the fabric will probably be slightly alkaline or acidic and that will have turned the upholstery fabric pink, or the suite turned pink. It may be that during science classes at school you were shown how litmus paper can turn a different clour when dipped in either acidic or alakaline liquid. Litmus is a filter paper which has been treated with a natural water-soluble dye obtained from lichens. The resulting piece of paper, called ‘litmus paper’, can be used as a pH indicator. 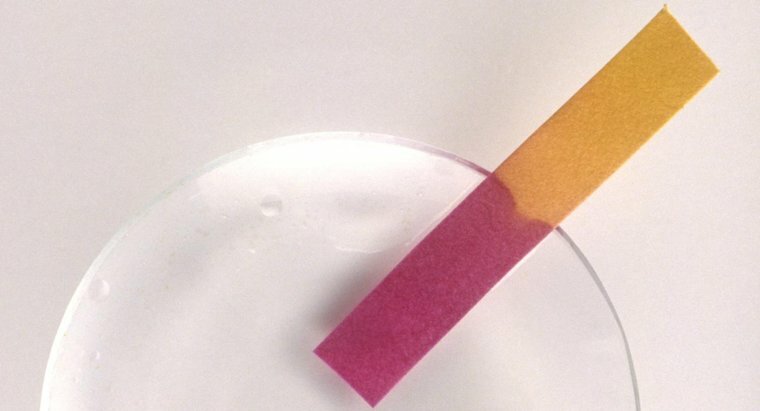 Blue litmus paper turns red to pink under acidic conditions (pH below 4.5) while red litmus paper turns blue under alkaline conditions (pH above 8.3). Neutral litmus paper is purplish in color. The upholstery will contain the water-soluble dye and that is what causes the sofa or fabric to change clour to pink. As you can see in the photo, when litmus paper is dipped in slight acidic solution, the paper turns red to pink colour. The sofa or upholstery will contain the indicator dye which is present in the fabric. Ph indicator chart shows a change in PH to the fabric turns the upholstery to pink. Litmus paper shows how the fabric turns pink. The photos opposite describe how litmus paper containing indicator dye chages colour when affected by a change in PH. The fabric of the upholstery in turn also contains an indicator dye which similarly changes colour when affected by cleaning or a spillage of liquid. Which type of upholstery, sofas or chairs are affected by pink staining? The answer is: In my experience virtually any type of upholstery can be affected by pink stains if the indicator dye is present during the manufactuer of the fabric. The most comon one I have found is flat weave fabric from different manufactures, although accasionally I have seen the problem occur in viscose velvet upholstery and cotton fabrics. To someone who is unfamiliar with this problem, it can seem very worrying and one can be forgiven for thinking that irreversible damage has occured to the upholstery. I have seen this problem appear on several internet forums including professional cleaning forums and also Mumsnet. ‘‘My sofas had a couple of stains on so I paid for a professional to come and clean them on Friday. They are light on colour one is very light grey and the other is beige. He came on Friday and spent an hour cleaning them. They looked fine at first but I came down stairs yesterday morning abs they are both clearly now pink! It’s patchy with less around the edges but its very noticeable. Will this go as they dry fully (been 48 hours since they he finished) or has he wrecked them? In the same discussion, it mentions that ”Laura Ashley Upholstery” is also affected. At one point it seems Laura Ashley had supplied quite a few suites that were affected. I have also come across several of these Laura Ashley suites that were affected by pink staining. Here is the link to the Mumsnet discussion on upholstery sofas turning pink. How do you remove pink staining from sofas and upholstery caused by cleaning and spillages? 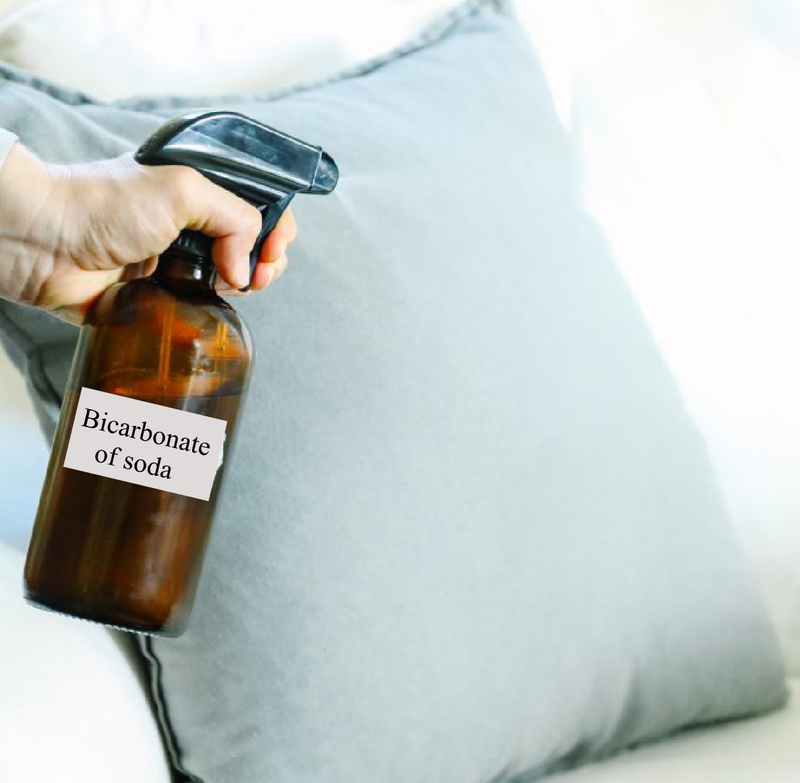 The answer is: by spraying on and applying a diluted solution of bicarbonate of soda. The bicarbonate of soda should cancel out the imbalance in the PH which was caused by the indicator dye present in the fabric upholstery. The original colour will gradually return as the material dries out. What you will need remove pink staining from sofas and upholstery caused by cleaning and spillages. 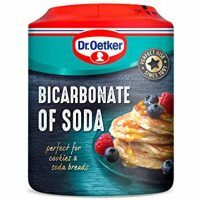 Use only bicarbonate of soda and not baking powder. Baking powder is slighly different and it has an additive to make cakes rise so may not work as good as the bicarbonate solution. 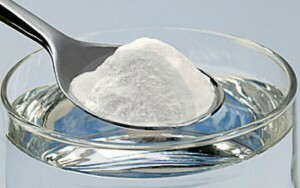 You will need to mix the bicarbonate of soda in a cup of tepid water just hot enough to dilute the powder. I have found that one heaped teaspoon of the powder in a cup is around the right dilution ratio. However if you are having problems removing the pink stains, it’s ok to increase the dilution. Applying the bicarbonate solution to remove the pink staining. When you have mixed the bicarbonate solution, pour it into a sprayer. If you do not have an empty sprayer handy, empty a cleaning sprayer that you have purchased from the store and clean it out thoroughly. You can fill it back with it’s original contents later. Using the sprayer, lightly dampen the fabric. I find that using a scrubbing brush lightly to work the solution into the fabric helps speed up the process. You may see the stains disappearing within minutes as if by magic! I have found though that some types of fabric may take an hour or two for the stains to disappear completely or untill the fabric has dried. If the fabric seems a little stiff when it has dried, it’s because of the bicarbonate. To remove the stiffness, just use a hand scrubbing brush on the material to soften the fabric and it should be fine. 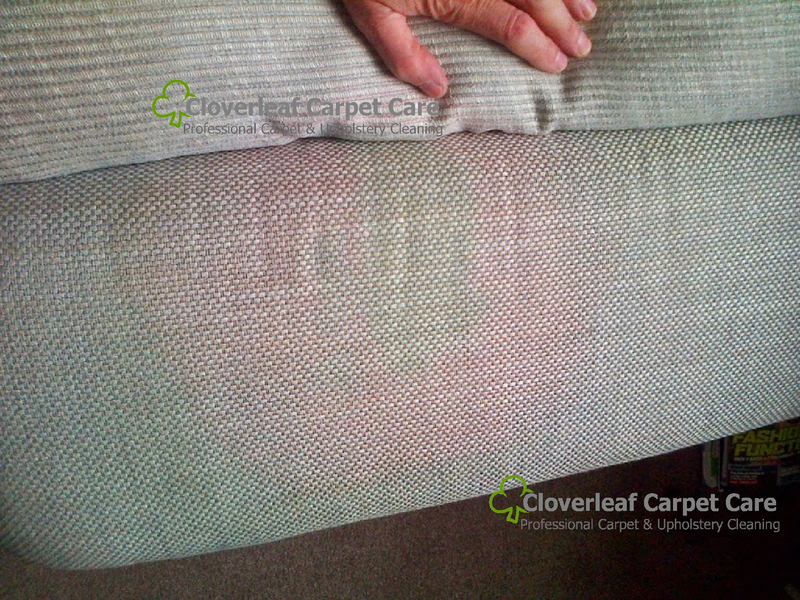 An example of a sofa cushion that has turned pink when cleaned. Laura Ashley suite, sofa upholstery turning pink after cleaning. In the photo opposite is a typical example of the pink staining to some sofa cushions. This was part of a Laura Ashley suite that had pink stains appear after cleaning. The stains were easily removed by spraying the fabric with a solution of bicarbonate of soda. The stains took around one hour to disappear after being sprayed. Pink staining to sofa has gone through the fabric. Here you can see how the staining is evident on the back of the fabric cushion. 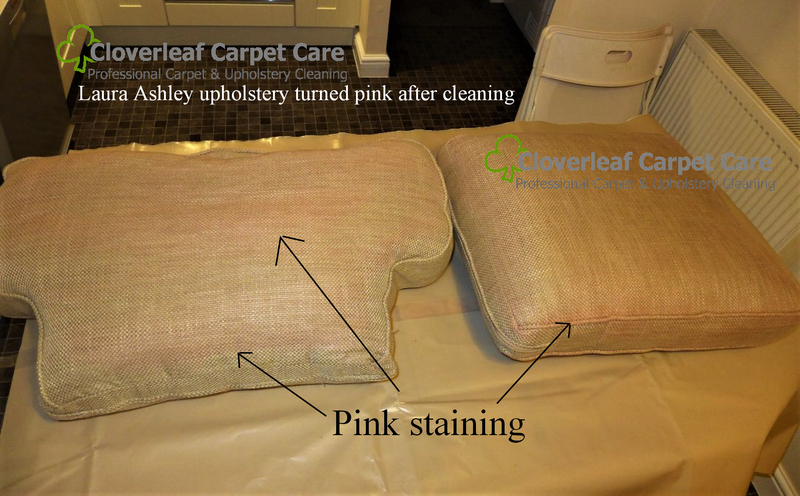 Here is another typical example where a professional carpet and upholstery cleaner posted this photo on a cleaning forum where the ”suite had turned pink”. 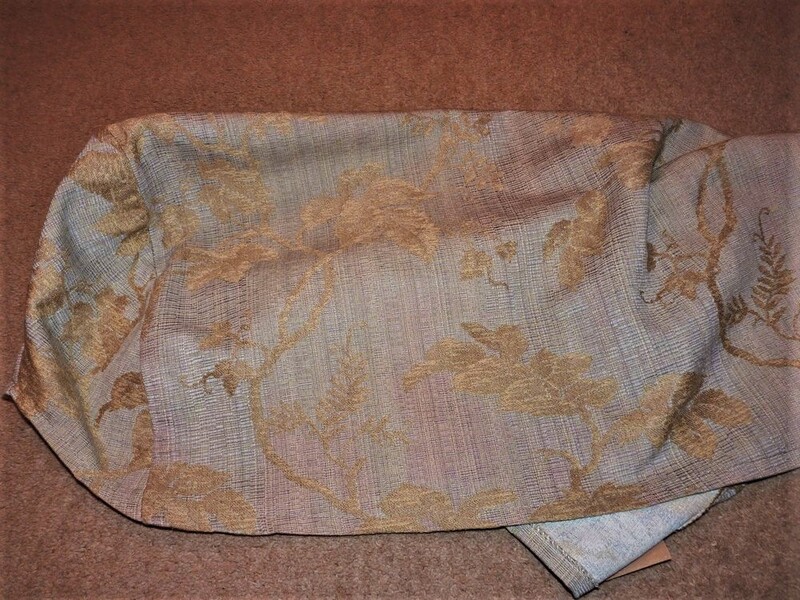 The make of the suite was unknown, but this type of flat weave fabric seems to be common for pink staining. I have also seen very dark matierials such as this with bright pink staining caused by light spillages of drinks during normal use of the upholstery. Here is another example. This was an arm cover, part of a Duresta suite that was cleaned and had turned pink in patches. It was easily rectified using the bicarb method.